Millions of hummingbirds are migrating north to their summer nesting territories. To make the most of this opportunity and to continue attracting hummingbirds to your backyard throughout the summer, be sure to choose a feeder that benefits the birds and you. WBU Hummingbird Feeders do not leak. This keeps bothersome bees and wasps away from the feeder. Our feeders have raised ports that prevent rain water from diluting the nectar solution. Nectar solutions can also be diluted by overfilling the ant moat. Our Hummingbird Feeders’ moats have drains that prevent this from happening. WBU Hummingbird Feeders are available in colors that mimic natural nectar sources. Our feeders have perches that allow hummingbirds to rest while feeding. 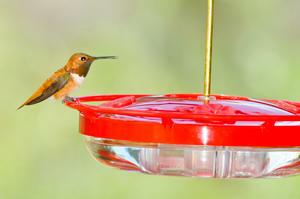 Our Hummingbird Feeders provide the best visibility, allowing you to view all the birds feeding at one time. Our feeders are easy to fill, clean, hang or mount and are extremely durable. WBU Hummingbird Feeders feature built-in ant moats to prevent crawling bugs from reaching the nectar solution. Our feeders have clear bottoms that allow you to see hummingbirds’ tongues lap up nectar (up to 12 times a second) as well as the level of nectar solution in the feeder. All WBU Hummingbird Feeders are backed with a lifetime guarantee.